The Bohn Park Flood Recovery Project has begun with primary staging of equipment and fencing of the construction area. Initial clearing and grading of the site will soon follow. Following initial preparation, river restoration work will quickly begin. Throughout construction, the entire project area will be closed off, including the multi-purpose sports court and the playground. Pedestrian, cyclist, and golf cart access will be allowed for the remainder of south portion of the park along the eastern trail, to access the bike park, multipurpose field and dog park. Vehicles will not be permitted into the park; parking is available on the east side of Second Avenue in the newly created public parking area (in front of the wastewater treatment facility). This phase of the Bohn Park Flood Recovery Project includes river restoration and improved ecological habitat, parking, a new restroom facility, continuance of the trail system within the plan area, a pedestrian bridge connecting to 4th Ave. on the western end of the park, picnic areas, river access, and other infrastructure enhancements. The majority of the work will is indicated within the blue highlighted area on the map. Project updates will be sent throughout construction. The anticipated completion for this project is Fall 2017. FEMA has now begun the next phase of implementation of Section 28, Clear Communication of Risk, of the Homeowner Flood Insurance Affordability Act of 2014, which requires the agency to clearly communicate full flood risk determinations to individual property owners. To meet this requirement, the National Flood Insurance Program reviewed the flood risk and underwriting information for every flood insurance policy, and is writing to all NFIP policyholders to explain the current risk level for their property and the relation of the risk to their premium rates. HFIAA requires gradual insurance rate increases for properties currently receiving artificially low (or subsidized) rates, rather than immediate full-risk rate increases. HFIAA requires increases to premiums for most subsidized properties of no less than 5 to 15 percent annually, but no more than 18 percent for an individual policyholder--with limited exceptions--until the premium reaches its full-risk insurance rate. 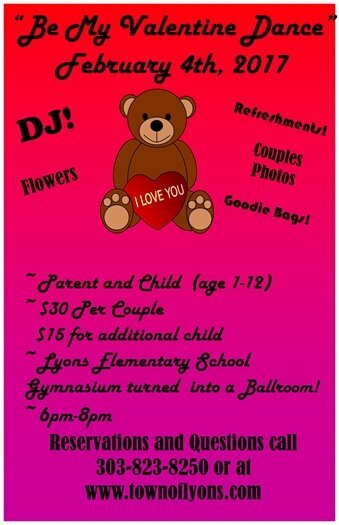 Parents, grab your dancing partners (ages 1 to 12), for an evening of Valentine's fun! 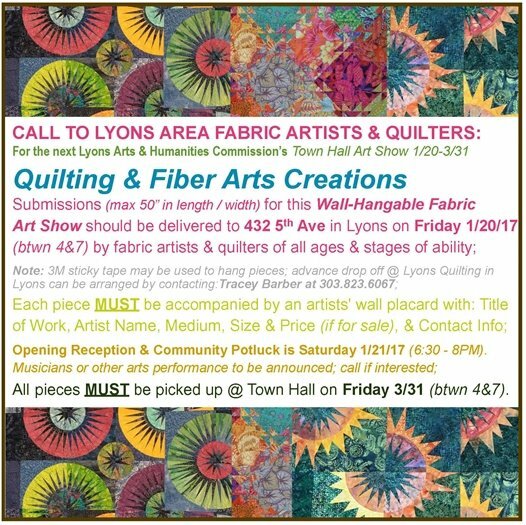 The evening begins at 6 p.m. on Saturday, Feb. 4, at the Lyons Elementary School Gymnasium. Parent and child couples are $30; additional children are $15 each. 5 Seminars | Wednesdays, 6:30 to 7:30 p.m.
Are you scared to talk about money? That can change! 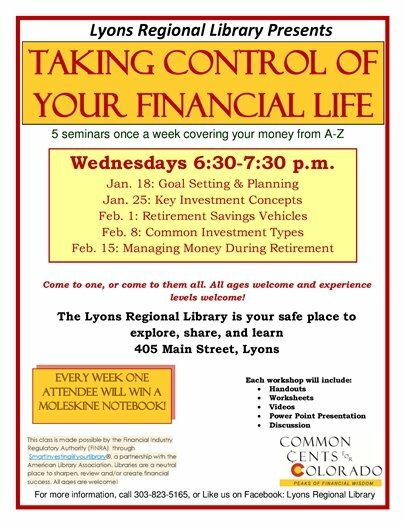 Supportive seminars at the Lyons Regional Library. Wednesday, Jan. 18: Positive Goal Setting and Realistic Planning.